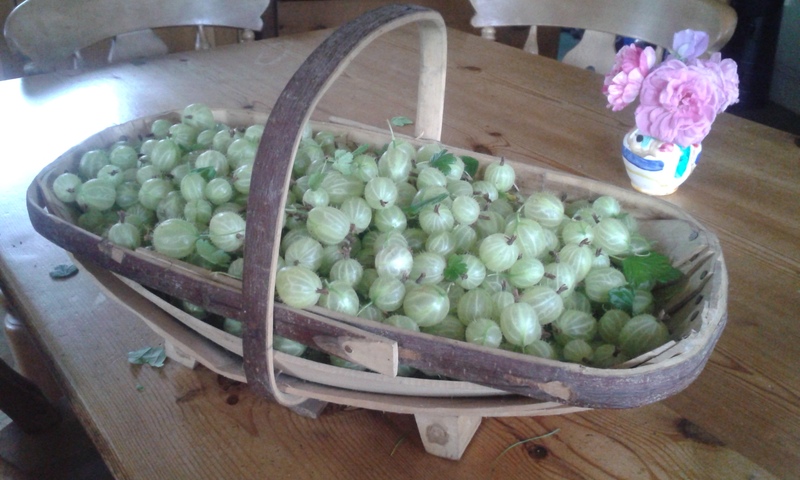 It’s uncanny that it’s exactly a year and two days since I picked last year’s crop of gooseberries. ( In search of Elderflowers.) The glorious sunshine that we had over the weekend has fully ripened the fruit on the first bush. So tonight was the night to venture into the fruit cage, armed with a trug, wondering what this year’s crop would weigh in at. My helpful husband pruned the bushes last autumn and the grass is a bit wet after heavy rainfall so I had to bend to pick the fruit and not cheat by kneeling. After a few minutes I wished I hadn’t eaten before setting forth on my gathering. Then I suddenly thought of yoga and the squat position malasana or garland pose that we had been practising in last week’s class. Problem solved – not quite the perfect yogi’s version as my feet were hip width apart and my hands were busy picking rather than in the prayer position. But what had seemed like a back breakin, dinner squashing job turned into a relaxing deep breathing moment of calming yoga and with the added bonus of a full trug of gooseberries. It is quite a relief that the first bush has only yielded a mere 8lb of gooseberries compared with last yea r’s 11lb but what is even better is that there are none of last year’s gooseberries lurking in the freezer. So tonight as I sit topping and tailing them, sadly not outside on a glorious sunny evening like last year but inside with a fleece on , I will think about what to make. First off will be my favourite gooseberry fool but I wonder what different recipes can I find to try this year? And of course due to repairs to the fruit cage it is unlikely that the second bush will suffer from the squirrel attack of last year so there will be pounds more of fruit to pick and another yoga moment. This entry was posted in fruit, Recipe and tagged elderflower, free ranging, gooseberries, yoga by Free Ranging. Bookmark the permalink.